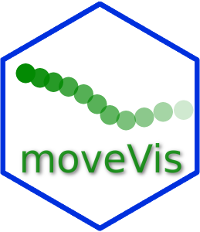 moveVis provides tools to visualize movement data (e.g. from GPS tracking) and temporal changes of environmental data (e.g. from remote sensing) by creating video animations. It works with move, sp and raster class inputs and turns them into ggplot2 frames that can be further customized. moveVis uses gifski (wraping the gifski cargo crate) and av (binding to FFmpeg) to render frames into animated GIF or video files. With version 0.10.0, the package has been rewritten from the ground up with the goal to make it easier to customize the appearance of movement animations. Thus, the logic of the package, its functions and their syntax have changed. df2move() converts a data.frame into a move or moveStack object. This is useful if you do not usually work with the move classes and your tracks are present as data.frames. align_move() aligns single and multi-individual movement data to a uniform time scale with a uniform temporal resolution needed for creating an animation from it. Use this function to prepare your movement data for animation depending on the temporal resolution that suits your data. subset_move() subsets a move or moveStack by a given time span. This is useful if you want to create a movement animation of only a temporal subset of your data, e.g. a particular day. get_maptypes() returns a character vector of available map types that can be used with frames_spatial(). moveVis supports OpenStreetMaps and Mapbox basemap imergay. Alternatively, you can provide custom imagery to frames_spatial(). frames_spatial() creates a list of ggplot2 maps displaying movement. Each object represents a single frame. Each frame can be viewed or modified individually. The returned list of frames can be animated using animate_frames(). frames_graph() creates a list of ggplot2 graphs displaying movement-environment interaction. Each object represents a single frame. Each frame can be viewed or modified individually. The returned list of frames can be animated using animate_frames(). add_labels() adds character labels such as title or axis labels to animation frames created with frames_spatial() or frames_graph(). add_scalebar() adds a scalebar to the animation frames created with frames_spatial() or frames_graph(). add_northarrow() adds a north arrow to the animation frames created with frames_spatial() or frames_graph(). add_progress() adds a progress bar to animation frames created with frames_spatial() or frames_graph(). add_timestamps() adds timestamps to animation frames created with frames_spatial() or frames_graph(). add_text() adds static or dynamically changing text to the animation frames created with frames_spatial() or frames_graph(). add_colourscale() adjusts the colour scales of the animation frames created with frames_spatial() and custom map imagery using the r_list argument. join_frames() side-by-side joins the ggplot2 objects of two or more frames lists of equal lengths into a single list of ggplot2 objects per frame using cowplot::plot_grid. This is useful if you want to side-by-side combine spatial frames returned by frames_spatial() with graph frames returned by frames_graph(). suggest_formats() returns a selection of suggested file formats that can be used with out_file of animate_frames() on your system. animate_frames() creates an animation from a list of frames computed with frames_spatial(), frames_graph() or join_frames(). view_spatial() displays movement tracks on an interactive mapview or leaflet map. rsMove, a package providing tools to query and analyze movement data using remote sensing. For other news on the work at at the Department of Remote Sensing of the University of Würzburg, click here. This initiative is part of the Opt4Environment project and was funded by the German Aerospace Center (DLR) on behalf of the Federal Ministry for Economic Affairs and Energy (BMWi) with the research grant 50 EE 1403.